Who have we gathered to celebrate tonight? Who is the one whom we gather to greet? Who is the one whose presence with us at the table we anticipate tonight? The baby of Bethlehem? The new-born Jesus? Well, sort of; but not really. The one who speaks to us in the Word tonight, and whose presence will be known in the breaking of bread at the table, is our executed and risen Lord, as indeed it is when we gather here every Sunday. I’m not meaning to diminish the value of the birth stories here, but to put them in context. Our faith is not one of recreating the history of God in Christ and experiencing each episode as though it were happening for the first time. We do not encounter the baby tonight, as though he were just born and the rest of the story was yet unknown. In fact, we only encounter the birth stories tonight at all because the rest of the story is so well known. Think about it. In about ten days time it will be Yvonne’s birthday, and those who gather with her to celebrate will not be doing so in anticipation of winding the clock back and encountering the baby Yvonne. Nor will they be expecting to be regaled with the stories of her birth. They will be celebrating the whole of her life and who she is now. And so it is with the birthday of our Lord Jesus, the Messiah. We celebrate the whole story, and who he is now, our executed and yet risen-to-life Lord. In fact, it is usually only when someone is extremely famous and influential that people become at all interested in the details of their birth. None of us are ever likely to be so famous that a brass plaque will be put up to mark the house we were born in. But when a person really stands out as truly exceptional, then people look back to their origins, their childhood and even birth, and search for indications of what was to come. What was it in the earliest formative experiences that went on to make this person who they later became? But for most of us, no one but our mothers and our psychotherapists will ever be interested! Now the point is, this looking back to the origins, if done at all, is only done with the benefit of hindsight. The stories of Jesus’s birth and infancy were written after his death and resurrection, and could only have been written by those who knew how the story unfolded. I’m not saying that they are not true. Not at all. But I am saying that they are clearly written by people looking for early signs of what was to come. We are not told his birth weight, head circumference, or how long the labour was. They are the things people speak of at the time, because there is not yet any more story to tell. That’s all you’ve got at first. But in the case of Jesus, what we are told instead is much of the gospel story in miniature; all the details that contained any sort of hint of what was to come afterwards. Let me highlight just a few of them tonight. The gospel writer John, who is not particularly interested in the birth stories and instead opens his account with a summary of the gospel story, says that the Word came into the world, but the world did not receive him. We tend to think that even the most unwelcome and reviled adults were once adorable and welcomed-anywhere babies. But looking back on Jesus birth after the experience of seeing the crowds turning into a lynch mob and stringing him up, Luke sees that it was always thus. 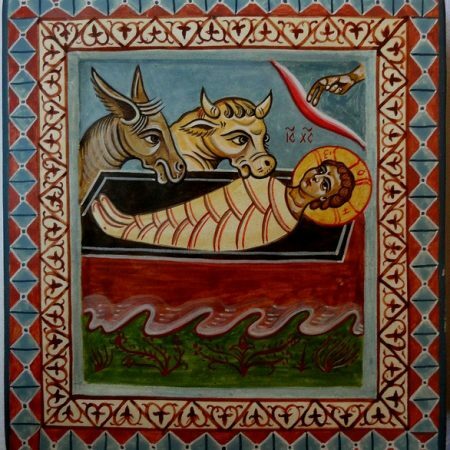 The world never welcomed Jesus, even at birth. He never belonged. He was being run out of town even before he uttered his first cry. The story of the census serves to situate this theme on a grand scale. This baby does not belong in Rome where the powers that be hold sway and make decisions that can disrupt the lives of entire populations. So we swing over to Nazareth, home of Mary and Joseph, but no, this baby doesn’t belong there either, and they are ordered out of town. Loaded on a donkey, they are trekked off to Bethlehem, but no, there is no place for this baby there either. Even the sight of a heavily pregnant woman in great discomfort and far from home does not open any doors. No one has a place for this baby. There is no room. He doesn’t fit. The doors are closed to him. He is pushed out to the fringes, to no-man’s land. He is treated like an animal. All of this might have been dismissed as a bit of bad luck at the time; a series of unfortunate coincidences. But when it was looked back on after his life story had played itself out, it all looked like part of a constant theme. “Foxes have holes and the birds of the air have nests, but the New Human has nowhere to lay his head.” “A prophet is without welcome in his home town.” Wherever he went, the shadow of the cross loomed ever larger and darker until eventually the world could stand him no more and all hell broke loose and the human race sought to slam the door on him once and for all. And still the story goes on, pretty much unchanged, today. We kid ourselves into thinking that we have welcomed Jesus and accepted him now. After all, look at what a big fuss we make of his birthday. It’s our biggest annual holiday. But is it Jesus, the executed and risen messiah we’ve accepted? Or is it a plastic baby surrounded by cute animals, safely behind the glass of some great department store? A baby who can give license to a festival of feel-good, with smiling children and mountains of presents and abundant food for all the family? But God help him if he turns up the same way again – as part of a middle eastern family, forced to flee their home and looking for a place of refuge. We’ll not only slam the doors, but excise the ground they land on from our immigration zone and confine them to some hellhole far offshore. When God entered our world, he was hounded by such violent rejection right from the word go. Of course, as John said, some received him and believed in his name. But who? Was it the educated who could read the signs and understand this revelation of God’s ways? Was it the powerful who knew true power and majesty when they saw it? Was it the religious who were well prepared to recognise the hand of God at work? No, it was mostly the nobodies. It was mostly the broken, the disabled, the abused, the forgotten ones. The educated and powerful and religious conspired to have him bumped off. And looking back through Jesus’s life later, Luke saw that it had always been that way. Who were the first to recognise him and announce that he was the one who would save the world? Shepherds. Nowadays, the shepherds look safe enough in the department store windows and on the greeting cards; gentle souls nursing fluffy white lambs. But don’t you believe it! Shepherds were among the most feared and reviled outcasts of that time. Think outlaw bikie gang. Nobody wanted to cross paths with these guys. Regarded as filthy vermin by respectable folks. The already-closed doors of Bethlehem would have been bolted and barricaded when these guys barged their way down the street, bellowing something about seeing the Saviour of the world in the back shed. None of this is good news if you have come looking for a baby Jesus who will politely take his place alongside plastic Santa as a mantelpiece ornament and add a little spiritual cream on top of the successful cake of your life. But if the world has already kicked the cake out of your hands; if you think you are probably beyond the reach of God and there is no hope for you, then this is very very good news. For what we have seen in the cross and can now see all the way back to the manger, is that there is nowhere too far gone for God to go, and no one too despicable for God to associate with. There is no hell-hole into which God will not descend and no gruesome fate that God will not endure to reach us with the love and mercy and nourishment that can set us free and raise us to life in all its fullness. For indeed, coming among us as the innocent one, as the completely loving one in whom there is no violence or hostility, he has unmasked the brutality of our systems of law and order and national security, and he has aroused the fury of those who seek to maintain order by keeping us united against the threat of the outsider or the dissenter or the loser. But absorbing the bitterness and rage without ever reciprocating it; indeed praying for his enemies and for those who lynched him, he breaks its power so that we might be saved from it and rise above it to the glory of mercy and love. Even as the broken victim of our callous ways, he offers himself to us without reserve, even offering himself as the food with which we might be nourished for new life. And again, those who now knew the risen Lord at the table – knew him as both generous host and living bread – when they looked back across his story, where did they find him at birth? In a feed trough! Not a table perhaps, but still an eating place. We gather around this table tonight, in solidarity with all who hunger for the bread of freedom, and in solidarity even with the simple animals who gather around a feed trough looking for nourishment. The outcast baby in the feed trough and the risen Lord hosting the messianic banquet of the kingdom both tell the same story. Emmanuel. God is with us. Life is triumphing over death. Love is triumphing over hate. Grace is triumphing over divisiveness and victimising. And the risen Lord is here, offering himself as the bread of life and nourishment for the living of love.